Feeling adventurous? Following our trip north where we showed you 10 top spots for wildflowers, we now take you south of Perth to check out a further ten superb wildflower locations. You can also download our Rough Guide to Wildflower Spots outside Perth which provides detailed descriptions and insider tips. There is a large reserve on the west side of Quairading and a smaller reserve just to the east of the town that is more accessible. You’ll find a good patch with Verticordias and other attractive plants. Charles Gardiner reserve is roughly half way between Quairading and Tammin and is well known for its diversity of native species. Corrigin is just two hours south east of Perth. Around Corrigin you’ll find patches of kwongan and a flora drive opposite the dog cemetery! The lookout is at the top of a “break-away” and the view is spectacular. The nearby Boolanooling Reserve has some very low kwongan with dwarfed plants plus a large patch of mottelcah. Take the road to Kulin to the Gorge Rock reserve. This contains some pristine communities. About 2 km from Kulin the “Macrocarpa Walk” on the left side of the road is maintained by the Kulin Branch of the Wildflower Society. This area is only 32km from Perth at the place where the Bibbulman Track crosses the Albany Highway. From the carpark side of the highway you can explore parts of the Jarrah forest along good tracks. Sullivan Rock has many moist areas with moisture-loving plants. This reserve is mostly in near-pristine condition. You may even see Woylie diggings – a small marsupial reintroduced here following control of foxes. it’s well worth the visit if only to see the tiny red bladder-worts growing in mossy patches at the base of the rock in late spring. In Harrismith you’ll find a wonderful sheoak thicket that is the best area for orchids. Narrogin has a large reserve called Foxes Lair within easy walking distance of town. It is well worth a visit and has a variety of vegetation types. Dryandra forest comprises several blocks only some of which are contiguous. Here you’ll find orchids and other small plants. The many roads in the area are equipped with tourist radios to tell you about the history of the area. Just past the village there is a large patch of kwongan which is ‘must see’. Ravensthorpe is an interesting area with a wide range of geology, soils and vegetation. Past the mouth of the Culham Inlet on the road up East Mt Barren you will see the multicoloured Royal Hakea. At East Mt Barren there is a pleasant mountain climb to the top. It starts at a long board walk constructed to protect the vegetation from the feet of nature lovers and from dieback. From here you can continue on a circular route which takes you through a real wilderness area with much to see and many good spots for stops – and eventually back to Ravensthorpe. Much of the Fitzgerald National Park is open mallee and shrubland with woodlands along rivers and swamps. 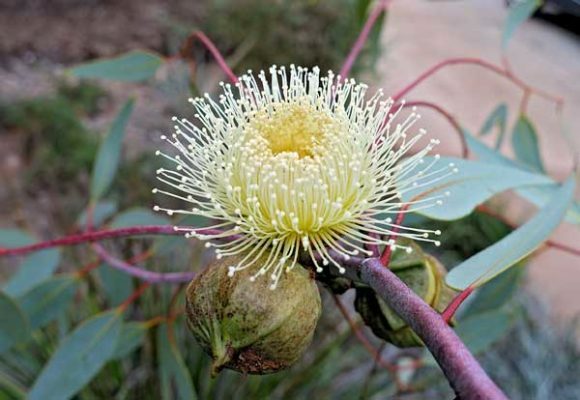 It is one of the richest flora regions in Western Australia with about 1900 identified plant species accounting for 20% of the known species in Western Australia. Much of the park is kept as wilderness with very limited access. Point Ann has spectacular views over a pristine bay in which whales are often to be seen. The Leeuwin-Naturaliste Ridge is the parent material of the soils suitable to the famous Karri forests and vineyards of the region. Near the east side of Alexandra Bridge there is an attractive area of Jarrah forest with a good ground flora. A few kilometres inland from the Leeuwin lighthouse is a good spot to hunt for orchids. Close to Quarry Bay is an interesting cliff with plants such as the Angled Lobelia growing in damp areas. The drive through the Boranup Karri forest is not to be missed. Head to the Meelup Beach picnic area and take the walking path towards Castle Rock, which is one of the best wildflower walks in the state. The Stirlings contain a large range of plant communities – thicket, mallee-heath, mallee, woodlands, sedge-swamps, rock screes on the tops of the peaks, and samphires. The park is 115 600 ha and has 1517 species of which 87 are endemic. There are 90 families and 384 genera. The plants of the range are the “bells” – species of Darwinia with large petal-like leaves that enclose the flowers. The information bay at the turn off for Bluff Knoll is a good place to see orchids. There are usually some interesting ones under the Wandoo trees. Up to 40 species can be found in the park including spider orchids, bird orchids, sun orchids and greenhoods. Near the edge of the creek there may be drifts of pink everlastings. Stands of Karri may be seen while driving over Torbay Hill. In Denmark, head to Ocean Beach to view the surrounding coastal dunes with their abundance of coastal heath flora. Scotsdale Road takes you through magnificent stands of Karri and gives views across some of the attractive farming country. For the walker, a visit to the summit of Mt. Lindsay offers a wide variety of colourful native flora. At William Bay visit Western Australia’s oldest National Park, where coastal heath vegetation may be found as well as a good swimming spot at Green’s Pool. Several sections of the Bibbulman Track, are accessible from the highway and a stroll along these would allow the visitor to see good examples of the flora in the area. In the Valley of the Giants, many specimens of two rare but very large eucalypts are preserved including the red tingle and the yellow tingle. After Walpole, move inland through forest, to Pemberton in the heart of the Karri forest. Make sure you visit the Gloucester tree. This was one of the ‘king karris’ – trees which dominated the local forest. A look-out was built in the top of the tree and used for fire spotting. If you are game enough, and fit enough, you can climb the tree. The view is great and you can look straight at the tree-top birds. Albany has an active branch of the Wildflower Society, which runs a Wildflower show late in September. The lookouts on both Mt. Clarence and Mt. Melville give magnificent views and the opportunity to see a variety of local flora, including hakeas, orchids and carnivorous plants on the rocky outcrops. One of the most visited national parks in the state is Torndirrup National Park with attractions as The Gap, Natural Bridge and the Blowholes. Near the old quarantine station there are nice walks through the coastal heathlands. On the eastern side of Oyster Harbour visit Gull Rock Reserve and Mount Martin Regional Botanic Park. From the Ledge Point Beach car park the walking tracks wind and climb through the Mount Martin Park. This has been designated as being representative of the endemic flora of Albany. There are spectacular views from various high points and a wide variety of flowers throughout the year – but best from August to December. About 20 km east of Albany the Two People Bay Nature Reserve provides plenty to see and hear. Ideally this requires a day’s outing to discover fascinating native plants and fauna, including the rare, elusive (and previously ‘extinct’) Noisy Scrub-bird which lives in the reserve. It is not called noisy for nothing. Its call may be heard a kilometre away! Remember, to download our Rough Guide to Wildflower Spots outside Perth which provides detailed descriptions and insider tips on all these locations.